For the 2009 film, see Papadom (film). "Appalam" redirects here. For the 2011 film, see Appalam (film). 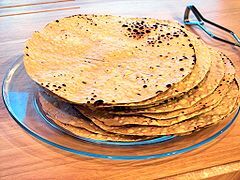 A Papadum is a thin, crisp, disc-shaped food from the Indian subcontinent, typically based on a seasoned dough usually made from peeled black gram flour (urad flour), either fried or cooked with dry heat (usually flipping it over an open flame). Flours made from other sources such as lentils, chickpeas, rice, tapioca, certain millets or potato can be used. Papadum is typically served as an accompaniment to a meal in India, Bangladesh, Nepal, and Sri Lanka or as an appetizer or snack, sometimes with toppings such as chopped onions, chopped carrots, chutneys or other dips, and condiments. In Pakistan, these are made of rice and often used as a snack or meal accompaniment. In certain parts of India, poppadoms which have been dried, but not cooked, are used in curries and vegetable dishes. Papadums has been a part of the Indian subcontinent for generations and is an intrisic part of everyday meals. Papadums are called appalam in Tamil Nadu, pappadam in Kerala, appadam in Andhra/Telangana, happala in Karnataka, and papad in Gujarat. They are mainly made in Rajasthan, Maharastra, and Gujarat in the north. In the south, Kerala, Madurai district in Tamil Nadu, Kanchipuram, and Chennai are major manufacturers. Papadum is derived from the Sanskrit word parpaṭa (पर्पट). Different types of papadums are sold at stores. Papadum recipes vary from region to region and from family to family. They are typically made from flour or paste derived from either lentils, chickpeas, black gram, rice, or potato. Bikaner is the hub of chickpea and green gram papadam manufacturing. Potato papadam is made in Varanasi. Most sweet- and snack-selling national companies are also involved in this business. In most Indian restaurants around the world, they are served as an appetizer with dips, which often include mango chutney, lime pickle, onion chutney, and raita. Papadum can be prepared from different ingredients and methods. Arguably, the most popular recipe uses flour ground from hulled split black gram mixed with black pepper, salt, and a small amount of vegetable oil and a food-grade alkali, and the mixture is kneaded. A well-kneaded dough is then flattened into very thin rounds and then dried and stored for later preparation and consumption. It may also contain rice, Jackfruit, Sabudana, etc., as main ingredients. Cracked black pepper, red chili powder, Asafoetida, or cumin or sesame seeds are often used as flavoring agents. Papadum is often associated with the empowerment of women in India. Many individual and organized businesses run by women produce papad, pickles, and other snacks. This provides them regular income from minimal financial investments. Shri Mahila Griha Udyog Lijjat Papad is an organization (owned and run solely by women) which produces large quantities of papadums on the open market, which started as a small business in the late 1950s, with an annual income in 2005 of about ₹650 crore (US$90 million). However, with the recent growth of modern trade in India and the growing consumer awareness, other brands have been gaining in popularity within this category. ^ J. Smartt; Emmanuel Nwokolo (6 December 2012). Food and Feed from Legumes and Oilseeds. Springer Science & Business Media. p. 28. ISBN 978-1-4613-0433-3. ^ World Bank. "Empowering Women in Urban India: Shri Mahila Griha Udyog Lijjat Papad" (PDF). Empowerment Case Studies. World Bank. Retrieved 2012-09-23. ^ Malathi Ramanathan. "Grassroots Developments in Women's Empowerment in India: Case Study of Shri Mahila Griha Udyog Lijjat Papad (1959–2000)" (PDF). Archived from the original (PDF) on 2007-03-15. Retrieved 2007-01-15. ^ "organization - The Beginning". Lijjat. Archived from the original on 2007-09-27. Retrieved 2006-02-04. This page was last edited on 4 April 2019, at 10:52 (UTC).